The exotic locale of Kathmandu has long been used as a catchword for the farthest reaches of the world. Click here to play! As the largest city of Nepal, Kathmandu has caused many visitors to marvel at its fascinating architecture and culture that has been influenced by India and China, as well as Nepal's native population. The Kathmandu slots feature many of the most recognizable symbols of this enchanting city. These include temples, temple bells, prayer wheels, elephants, grain bags, and a map of Nepal. Oddly, Mount Everest isn't really featured in this game, despite how many people associate Nepal with that mountain. Try the Kathmandu slots today for a taste of a unique culture and the chance to win a mountain of treasure. The Bell symbol is the scatter symbol for this game, paying out on the total bet when 2 or more land on the reels. 2 pay equal to the total bet, 3 pay twice the bet, 4 pay 25 times the bet, and 5 symbols pay 100 times the total bet. The Wild Prayer Wheel symbol is the substitute in this game, able to substitute for any symbol other than the scatter symbol. There are two bonus games in the Kathmandu slots. 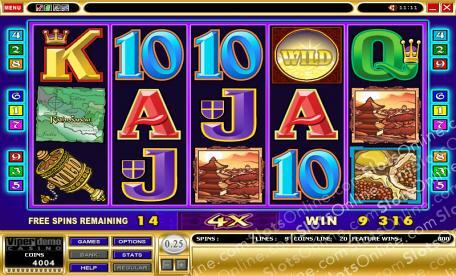 One is the free spins feature triggered when 3 or more Bell symbols are scattered on the reels. This awards 15 spins at a 5 times prize multiplier, plus an extra temple wild symbol during the free spins. The other bonus game is the gamble game that can be played whenever a win on the reels is made. In this game, you stake your winnings and try to guess the color or suit of a playing card. A correct color guess doubles your win, while a correct suit guess quadruples the win. An incorrect guess forfeits the stake.